Composed by Joe DeSa. Saddle stitch. Latin/Guitar Instruction. Book & CD. Duration 65 minutes. Published by ADG Productions (AD.ADG101). ISBN 1882146379. 12 x 9 inches. 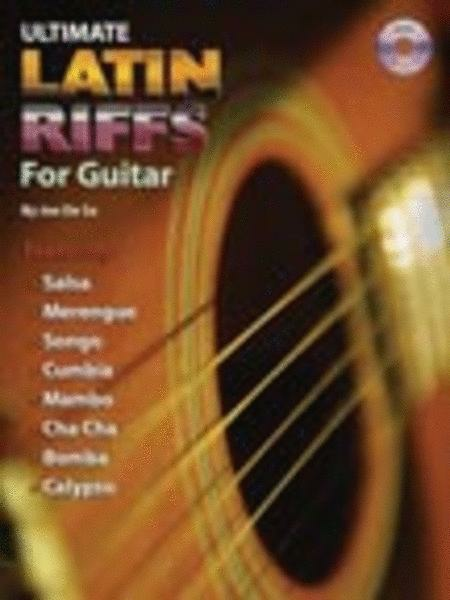 Ultimate Latin Riffs for Guitar written by Joe N. De Sa provides an extensive study into various Latin guitar styles including: Salsa, Mambo, Merengue, Calypso, Cha Cha etc. These exciting 50 examples will have you spending many enjoyable hours learning the intricacies of Latin guitar playing. The book is transcribed note for note from the superbly recorded audio CD. Each example is recorded twice, the first version with guitar, piano, bass and drums and the second version with just piano, bass and drums so that the guitarist can practice along with the rhythm section.